The automotive industry is in a state of disruptive transition. Automotive manufacturers are being challenged by fast-changing customer needs, advancing digital technologies, pervasive connectivity, and environmental regulations. To capitalize on industry opportunity in the face of these disruptions, companies will need to shift from their traditional “disconnected” and “analog” manufacturing methods to a completely connected and digitized factory floor. Each of these trends will directly impact how automotive manufacturers operate and survive in a highly competitive market. We believe a digital transformation will be required for those who want to survive the disruption. Let’s take a closer look at each of these trends. In today’s digital age, drivers and riders now expect the same level of connectivity from their vehicles that they get from their smartphones, laptops, tablets, and tech wearables. This includes everything from high quality infotainment systems for passengers to assisted driving and parking with payment from the dashboard. With so much technology required to deliver the best customer experience, a single vehicle could require 100 million lines of code. And as technology advances, the lines of code will only increase. So, what does this mean for manufacturing? There’s now a digital technology component to everything an auto manufacturer does, from engineering to the factory floor. This new level of digital capability requires a different skillset than the traditional factory worker. As technology evolves, it’s critical that the workforce does, too. To attract and retain the right digital talent, everything on the factory floor needs to become digitized to match consumer environments. With no driver, the autonomous vehicle experience is all about the passenger. Extra attention must be given to product design to make that experience impactful. It’s also important to drive efficiency, effectiveness, and enable more autonomous vehicles on the road for longer periods of time safely. A key factor for reliability will be autonomous vehicle access to field service vs. traditional service models where vehicles are brought to a dealer/garage. There is a unique opportunity for automotive companies to capitalize on this by developing new business models catering to field services by offering after-sales customer support and maintenance “in the field”—focusing on optimal customer service as a point of differentiation. Automotive companies will continue to invest the most in preparing for increased connectivity, autonomous, and electrification trends. It’s important to find other areas to reduce cost to be able to fund these types of investments, while maintaining profitability. To start, companies can save margins by reducing cycle times and waste. To do this, auto manufacturers must make sure that their equipment is always running optimally and unplanned downtime is avoided. By implementing industrial applications on the factory floor, manufacturers can get a unified view of asset data to make informed decisions on how their equipment is running in real-time. Young consumers have grown up using car-sharing or ride-sharing services that place far less value on car ownership. That means future drivers will not be as motivated to own a car as they are today. Automotive companies are just coming into the ride-share market and are entering it by battling against well-funded technology companies for market share. Automotive companies need to grow market share in ridesharing as it will become one of the only ways to maintain customer brand loyalty at scale in the future. In order to do this, automotive companies need to partner with tech companies or start their own ride sharing or shared leasing systems. The automotive industry will start to see reductions in aggregate car buying, so costs must be driven out of the supply chain by leveraging industrial technologies like machine utilization, machine learning, and advanced analytics. Electric and hybrid vehicles are not new to the market but are continuing to evolve and create new disruptions as they advance. Currently, the European region is leading the charge (no pun intended) with electrification—North America is taking notice and trying to catch up. For manufacturers, electrification is influencing cost effectiveness and innovation around batteries and shorter cycle times. Electric vehicles are very expensive to manufacture due to throughput cost and require a different set of capabilities to produce. However, if manufacturers embrace a digital approach, they will find another opportunity to capitalize on a disruptive trend. Electric cars generate terabytes of data each time they are driven. Manufacturers can analyze this data to find new ways to make the manufacturing process more efficient and uncover a deeper understanding of where operations can be optimized. One thing is clear: automotive manufacturers need to learn from technology innovators and begin to digitize their entire manufacturing process. And it’s no secret. According to our studies, by 2022, automotive manufacturers expect that 24% of their plants will be smart factories, and 49% of auto makers have already invested more than $250 million in smart factories. However, just a few automotive companies have translated this enthusiasm into tangible results – 42% of smart factory initiatives are struggling because the digital maturity of their manufacturing operations is below par. The challenge they need to overcome is to move at speed, make changes now, and own the customer experience before technology disruptors take it from their grasp. Now is the time to get ahead and accelerate your digital transformation to drive real change before it‘s too late. By doing so, automotive companies can move beyond point solutions to drive real digital strategies to make smarter, data-driven decisions around your plant production and operations, while ensuring vehicle quality and safety. Check out GE Digital’s new Industrial Internet at Work video series here to learn more and find out what steps you can take today to capitalize on these disruptions. Mike Hessler is currently Vice President and North America Automotive Sector Leader at Capgemini. In that role, he is responsible for go-to-market and delivery of services to auto manufacturers, parts suppliers, automotive dealers, and the entire automotive ecosystem. Hear Mike Hessler, Vice President and North America Automotive Sector Leader at Capgemini, share insights on the current state of the automotive industry, how new trends are disrupting it, and how to capitalize on this new opportunity with the Industrial Internet of Things. 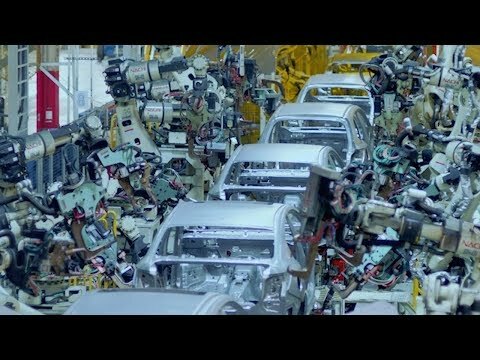 Watch on demand and hear automotive industry experts from Capgemini, GE Additive, and GE Digital discuss the current state of the automotive industry and the biggest trend lines that are influencing it, as well as how to leverage the right industrial applications to help your company capitalize on the upcoming disruptions.